At last I can deliver a little prophetic good news to all of you who have read my forebodings that Obama has come to his destiny too soon and may see his presidency come to tragedy. That future is still lurking, however, Obama has shown that attribute of potentially great leaders to change personal course, evolve, adapt to challenges, seek capable people of diverse viewpoint for council and thereby change the inclination of their own destiny. Intelligence does not thrive in a rigid, ideological mind-set. A president who never changes his views, no matter what outside evidence compels is just the kind of old-style president Obama intends not to be. He’s no Bush. That’s change, folks. Moreover, it doesn’t only bring a change in Washington beyond the ideology of the extreme right. You on the extreme left must also “change.” Get used to it. Obama’s not going to be the president you married. Also, as I predicted, the first fall-out in the Obama love-fest would be those on the ideological left. His most mindlessly emotive followers are already wondering if Obama is the “change” they can really believe in. Now he’s formed a cabinet party of rivals, hawks, conservative democrats, a Republican Secretary of Defense and today officially selected his chief rival from the Democratic primaries to the most powerful cabinet post next to his own: Hillary Clinton, Secretary of State. Some of the sour-gripers from the left have left behind their zingers in my “contact me” file about it. Here’s one from — let’s call her “EYE” — posted on October 22, 2008. She entered it 13 days after I predicted Obama would win the presidential elections on Coast-to-Coast AM (7 October). You can read those predictions on my blog archive and my assessments. EYE disparaged me for “riding the fence” and giving myself room in order for my predictions to play out. I guess saying on the show Obama was going to win was riding the fence, and I’m assuming she didn’t or wouldn’t want to register what I said leading up to that forecast, recounting my evolution of a vision of Obama becoming president that trails all the way back to August 2006. I’ve heard that one before. I have videotapes of a morning talk show appearance I made in Portland Oregon the day after the Republicans won the House and Senate back in November 1994. The host believed it marked the end of Bill Clinton as no more than a one-term presidential failure. Not only would Clinton not be a failure, I countered, but also he would win a second term in 1996, and handily. The host hooted and called me crazy. Four years later, in 1998, I appeared on that same show and reminded the same host that I had predicted the outcome of the 1996 election correctly. EYE did go on and make an interesting challenge. I’m grateful to her for offering it. She triggered an epiphany that I thought was timely, given that I read and responded to her missive today, as Obama wheels out Hillary Clinton and his foreign policy team for public view. As for the rest of your predictions, how are you going to prove that Obama would be better off if he choose Hillary as his running mate? Well, as it turns out today. He did. Officially. Giving her the next most important post in his Administration after president. The Obama-Clinton team was destined to happen. Where I got it wrong was thinking it would be Obama and a VP Clinton. I got the framing of destiny wrong, but not the essence of destiny. The dream-team has formed. It is even a stronger framing of team-power than I had foreseen. Another aspect I saw in the past about the Obama/Clinton destiny was essentially correct but reality has framed it differently. Obama will learn to be president, but not as Hillary’s Vice President or as a Vice President to Hillary. 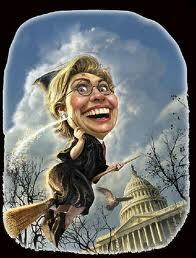 Now Hillary “can” teach Obama to become a great president as his Secretary of State. Her sharp intelligence will sharpen and temper his own. Would Obama’s destiny be played out better, if… the Clintons were running the White House, under the guise of her vice presidency? He has picked a cabinet filled with Clintonites. He has placed Hillary in the most important cabinet post. It seems Obama has more foresight than you or I grant him and more confidence in his ability to be the medium of change “and” learn from challenging interchanges of worthy rivals how to be great like his idol, and perhaps even his past life incarnation as Lincoln. Because that’s exactly what would have happened if he would have chose Hillary as his running mate. I now hold more positive hope for his presidency because Obama has brought in the kind of Clintonite experience he’ll need to learn fast and become the great president I foresaw he would be later in 2012 rather than sooner. Now, with Hillary and other Clintonite mentors, Obama has brought that future forward. It is a very positive development, prophetically speaking. Obama will need every advantage to face what’s coming. A man can come to his destiny too soon, however a potentially great man can change his destiny. Our human intelligence changes the future. May his change be “smart” government. If it is and if he can survive the next two years, Obama who has come too soon to destiny, will invite destiny to come a little earlier. This entry was posted in Election 2008, Geo Politics and tagged appointed, Hillary Clinton, Obama, rivals, Secretary of State. Bookmark the permalink. Post a comment or leave a trackback: Trackback URL.